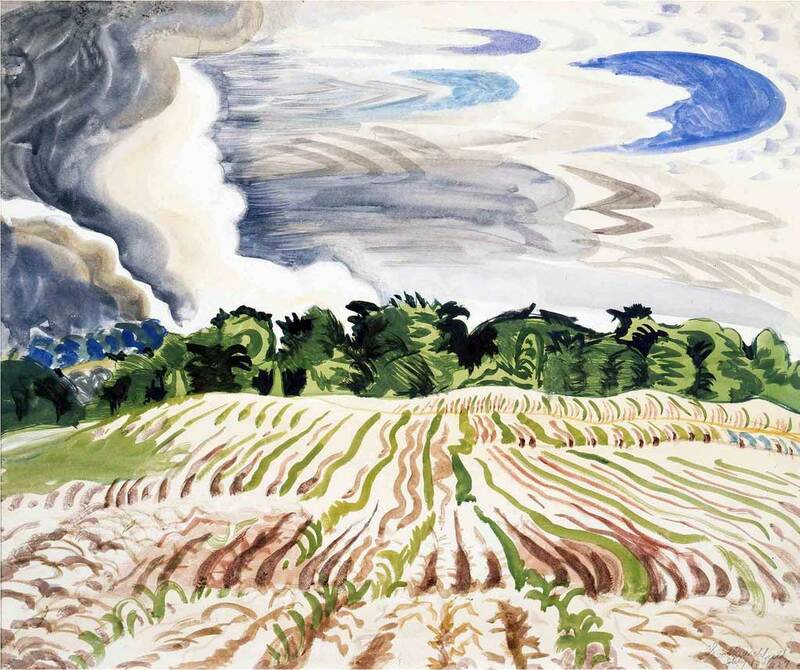 I highly recommend the current exhibition “Charles E. Burchfield: Weather Event” at the Montclair Art Museum in Montclair, N.J. [Sept. 16 through January 7, 2018]. 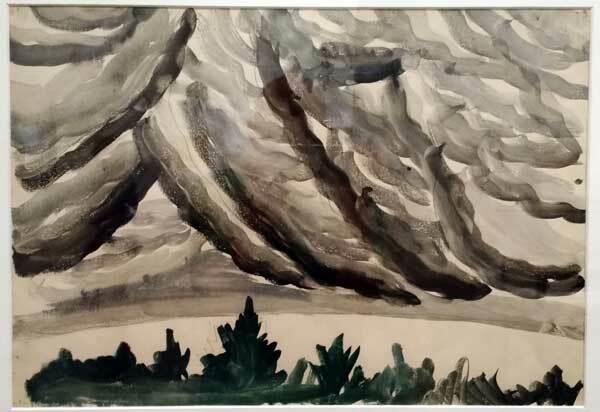 For me, it is always an event, and a privilege, to view up-close and in person the ecstatic, intense, mystical art of the great Burchfield (1893-1967). A more intelligent, enthusiastic, fun couple with whom to view art, you couldn’t find. 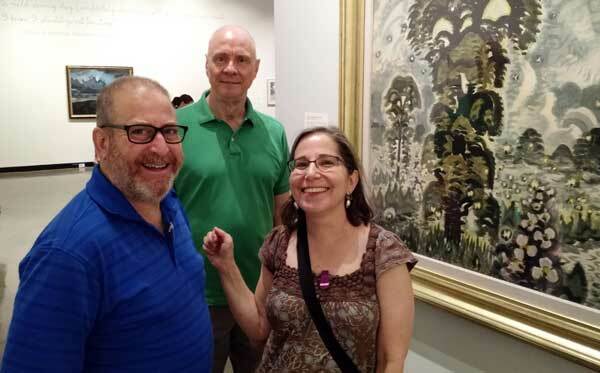 Dennis Doros, Joe Kennedy and Amy Heller at the Montclair Art Museum. July Sunlight Pouring Down, 1952. On permanent loan to the Burchfield Penney Art Center. 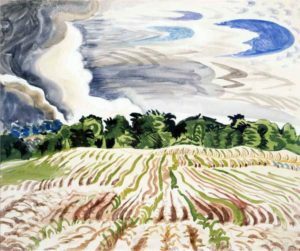 For many years, I have loved Burchfield’s awe of nature, as seen in his expressionistic landscapes painted in and around his Buffalo, New York, home. This detail from July Sunlight Pouring Down shows how Burchfield used color and line to transform sensory experiences into kinetic visual elements. It also shows the artist’s “dry” brush technique of layering watercolors, rather than saturating the paper. Yellow Afterglow, 1916. Burchfield Penney Art Center. Many images in the Montclair show, which focuses specifically on weather depictions, date from this seminal 1916-1917 period. His strong graphic design sensibility shines through in fascinating watercolor and gouache works of forests, gardens, plants, flowers, brooks, clouds, mysterious ravines, and abandoned houses. From 1920 to 1929, while building his reputation as a fine artist, Burchfield supported his wife and five children as a wallpaper designer. Church Bells Ringing, Rainy Winter Night, 1917. Cleveland Museum of Art. In his notebooks, he developed a visual language for human emotions and sounds (“Conventions for Abstract Thoughts”). Embedded throughout his paintings are symbolic representations of forces of nature (wind, rain, snow, sun and moon light) and sounds (humming insects, bird song, church bells, train whistles, even reverberations from telegraph wires). 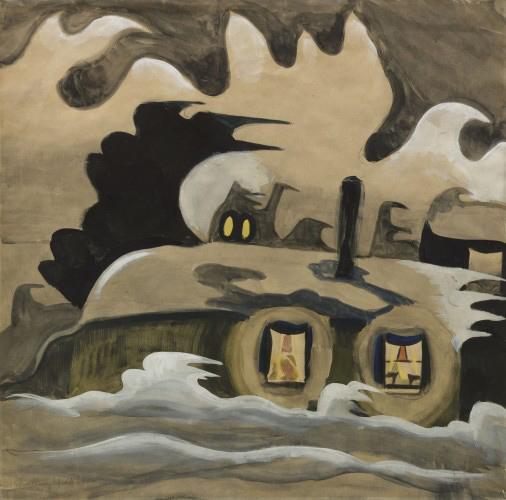 In images of houses and other buildings, an anthropomorphism, or empathic visualization, comes through which (to me) makes Burchfield a kindred spirit close to animation. Fireflies and Lightning, 1964-65. Burchfield Penney Art Center. 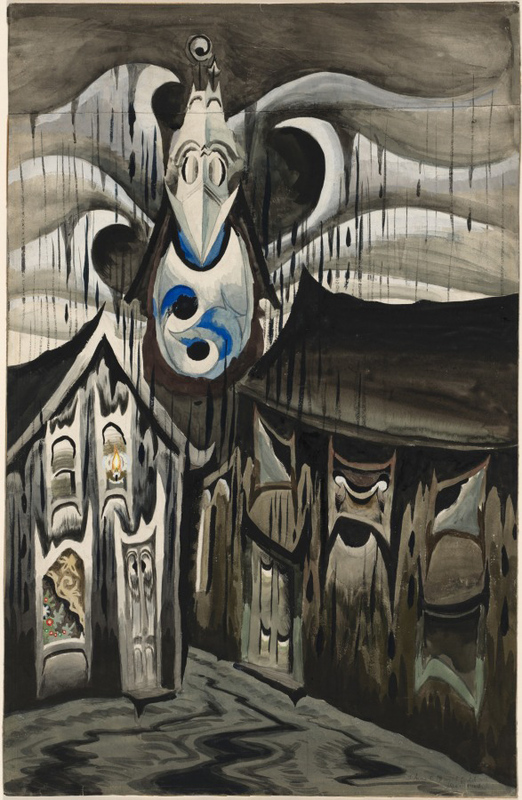 Although not a part of the Montclair exhibition, both The Night Wind, 1918, seen here, and Church Bells Ringing, Rainy Winter Night, 1917, second image above, show Burchfield’s use of anthropomorphic forms, and symbolic “Conventions for Abstract Thoughts.” The Museum of Modern Art, New York. As it turns out, Burchfield did have an interest in animated films and other movies in his essential awareness of “transience” in seasonal transitions, invisible vibes, and motion. Afternoon Wind, 1964. Click image to enlarge. Burchfield Penney Art Center. In 2009, I had the pleasure of personally finding that out when I flew to Buffalo to talk with Nancy Weekly, the world’s leading Burchfield authority, Curator and Head of Collections at the spacious Burchfield Penney Art Center. The Center, which had opened the year before, holds the largest collection of the works of Charles Burchfield, including a facsimile recreation of the artist’s studio. 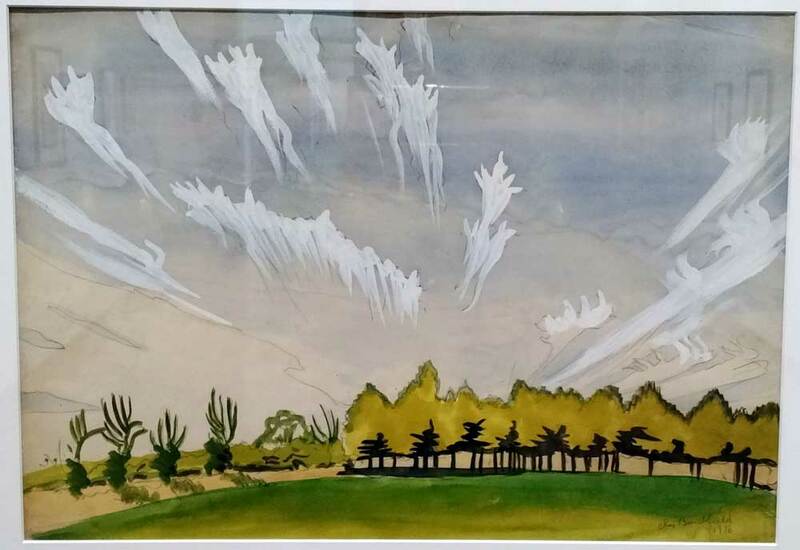 Clearing Sky, 1917, shows how Burchfield incorporates the metamorphosis of natural elements and the passage of time , into his paintings, expressing in a single image some concepts that are also fundamental to animation. Click image to enlarge. Burchfield Penney Art Center. 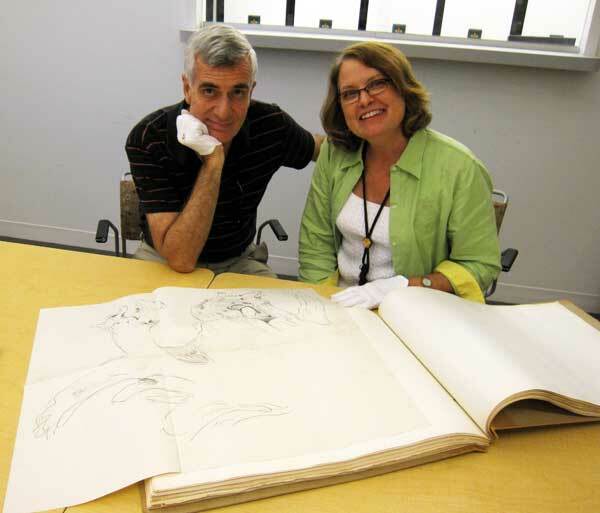 A rare treat: examining one of Charles Burchfield’s albums of his drawings., with Nancy Weekly of the Burchfield Penney Center, August 2009. Ms. Weekly invited me into the museum’s archival section, restricted to scholars, where I was treated to a white-glove inspection of some of Burchfield’s hand-written journals and handmade albums and folders containing 25,000 preliminary drawings and studies. Conventions for Abstract Thoughts: Fear, Morbidness (Evil), and Melancholy/ Meditation/ Memory of things that are gone forever, 1917. Click image to enlarge. Burchfield Penney Art Center. 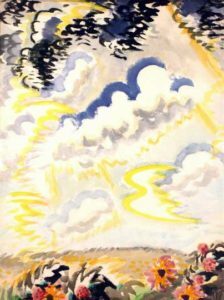 “Also related to animation,” she explained, “are his developments in 1917: ‘Conventions for Abstract Thoughts’ for human emotions and what I call audio-cryptograms, which are visual patterns for nature sounds, particularly insects, birds and frogs—and later phenomenon such as the wind/telegraph harp.” The visual “conventions” in many of Burchfield’s early and late period paintings convey psychological emotions when realism proved “inadequate for that goal.” For example, the ‘fear’ icons, in the upper portion of the sketch at left, can be seen at the center of Church Bells Ringing, shown above. The Insect Chorus, 1917. Munson-Williams-Proctor Arts Institute, Museum of Art, Utica, New York. Burchfield’s journals confirm his keen interest in moving pictures and animation, and are peppered with his straight-forward film critiques. Benjamin J. Townsend, editor of Charles Burchfield Journals: The Poetry of Place, notes that Burchfield “did not hesitate to point out artistic flaws, even in those films he otherwise admired.” His tastes ran to Westerns, historical epics like The Ten Commandments and War and Peace, and, above all, the animated films of Walt Disney. Sunburst, 1929-1931, is one of Burchfield’s more naturalistic landscapes, a stunning tour-de-force painted in oil, rather than his preferred medium of watercolor. Click image to enlarge. Burchfield Penney Art Center. I enjoyed it more than the first time. Those flaws I noticed seemed to have lessened or disappeared. I had the thought while watching it that Walt Disney with his whimsical art will do more for the general peace & happiness of the world than all the propaganda and peace talk in the world; for to me it is inconceivable that a nation looking at such things could foster hate. 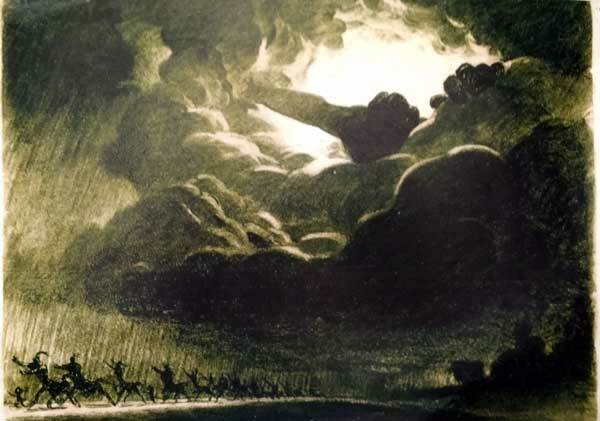 Although Burchfield violently disliked the on-screen aesthetics of Disney’s Fantasia (1940), he might have appreciated the power of this concept drawing of clouds from the “Pastoral” sequence. (Perhaps drawn by Martin Provensen.) 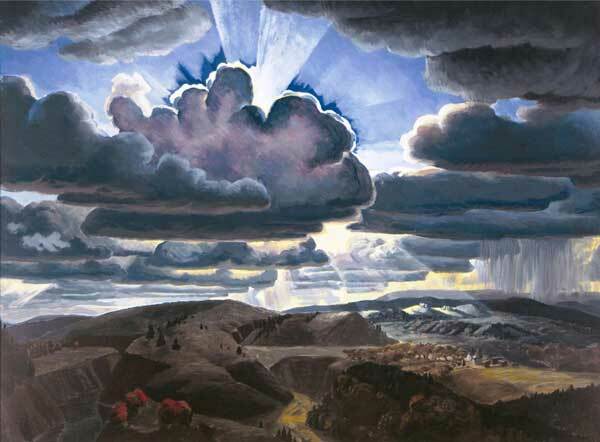 Burchfield’s own Sunburst, seen above, and his 1916 Cloud Study, below, share a similar dynamic massing of the cloud forms and silhouetting of foreground elements. 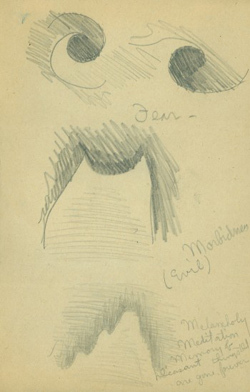 Untitled (Cloud Study) June 24, 1916. Burchfield Penney Art Center.
. . . rage was so great that I was literally beside myself. There is no artistic need or justification for such a collaboration as this, in the first place—but even if we should agree it was worth trying—the cheap, low vulgarity of over half of the episodes, was simply incredible … The treatment of Beethoven’s 6th Symphony was pure destructive burlesque. Many writers have tried to excuse Disney on the grounds of ignorance — but it is more than that—it is a deliberate aim to besmirch and degrade everything that is fine & noble in our culture — It is like revolutionists throwing rocks thru cathedral windows. Somewhat of a disappointment — although the thunderstorm in the woods, the transition of autumn to winter, and the forest fire were still enchanting. Hard to take were the background music and the cloying sweetness of spring effects, and the “cuteness” of the animals with the enormous hard stylized eyes, and bulging foreheads. The humanizing of the animals was not a happy thought. 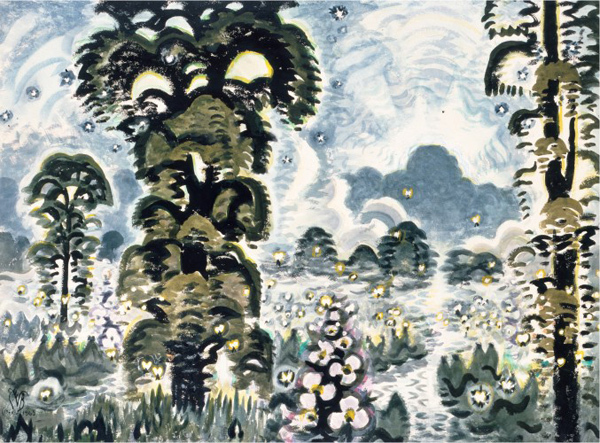 Burchfield admired the forest fire sequence in Bambi (1942). 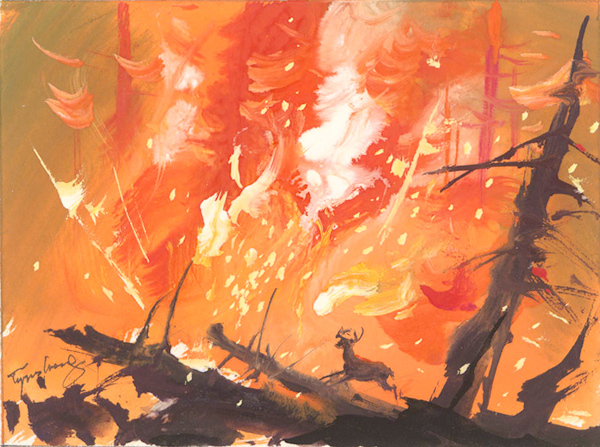 This original concept painting (above) for that sequence, by the film’s designer Tyrus Wong, captures the power and intensity of the moment. Equally fascinating as the comic situations arising out of his near-sightedness, are the highly decorative and conventionalized backgrounds and scenes. 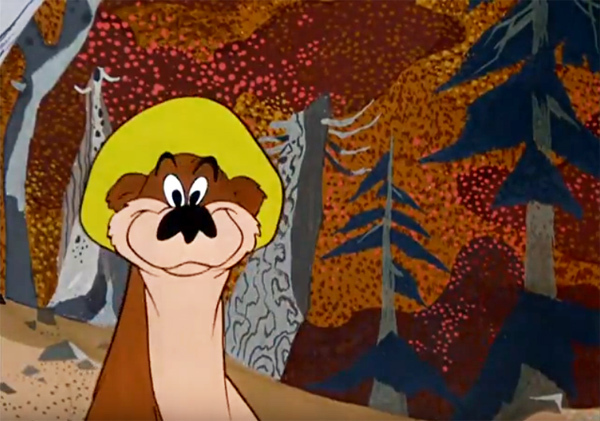 A golfing and hunting sequence had utterly fantastic trees & woods, yet somehow having the inner character of the woods much more than a more realistic or sentimental approach (such as Disney does to death). Of especial beauty for me, of course, was the incident of showing hepaticas pushing up out of dead leaves, and growing into full bloom. Apparently such plants are never [quiet], but move [too] slowly for us to see with the unaided eye. By speeding up the process, they were seen to sway back and forth as if in ecstasy. The speeded up picture of wild cucumber vines, made them apparent like serpents, swaying and writhing, looking for a place to fasten to. Burchfield damned the accompanying (unnamed) cartoon as “incredibly bad,” concluding, “An amazing man, Disney, full of contradictions.” The shorts released by the Disney studio on Nov. 6, 1956 that accompanied Secrets of Life included a live-action short, Cowdog, and the cartoon was A Cowboy Needs a Horse. Burchfield, now 72 years old . . . modestly disclaims that his early work inspired your animations of nature in any way, but rumor persists. Exhibition program will feature about a doz. one of two paragraph statements, trib [sic] and greetings on his 50th anniversary as noted artist. If he inspired you in any way he would like to include a short message from you . 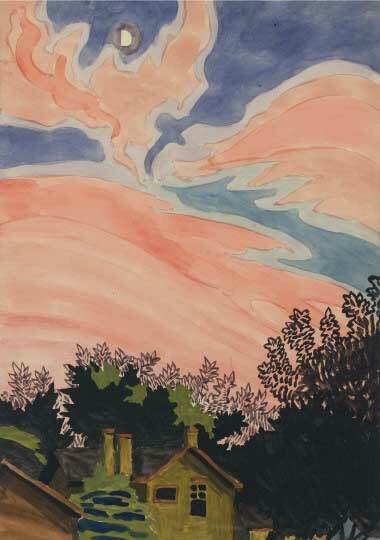 . .
Windswept Sky, 1916. Click image to enlarge. Burchfield Penney Art Center. Walt Disney died on December 15, 1966. Charles Burchfield died on January 10, 1967. Afterglow, July 8, 1916. Burchfield Penney Art Center. 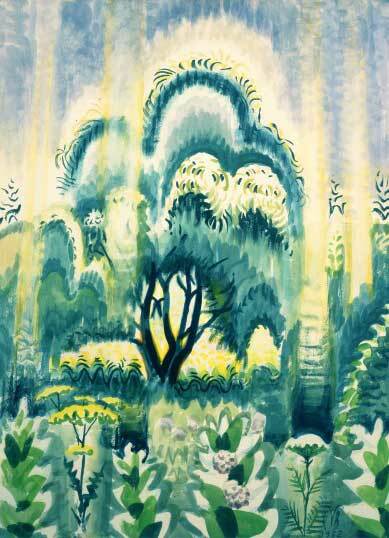 Thank you for this extensive opening into the magical realms of Charles Burchfield. I am struck by the dynamics of expressive movement in the landscapes that are “alive” with an evocative energy. They remind me of many dreams I had as a child about fierce weather as we had many black clouds just before tornados growing up and with vivid memory of the twisting at the point of contact with the Earth. The Whitney video is excellent. A joy to read At the beginning of the day, John. I’ve determined that my role in the worlds of art is that of “Appreciator”, and my duty to deepen my ability to engage that role. 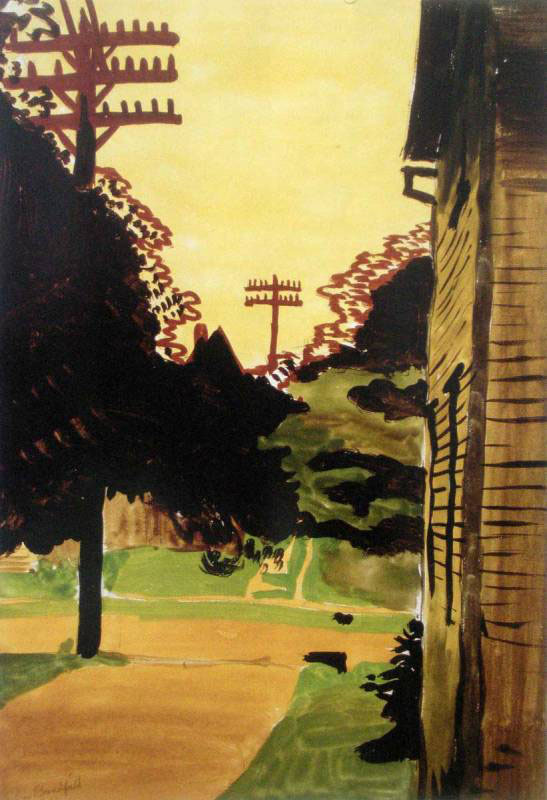 Thank you for this introduction to Burchfield. And who knew? He’s just an hour away at Burchfield Penney. I’m going to try to forward the blog to Denis. He’ll love to read it. Good wishes. Love this blog. I can see touches of Bridgehampton- your gorgeous film about your garden. Lovely escape on this rainy day! Your blog posts get more and more interesting! Thank you so much for your writing and contextual images and observations! 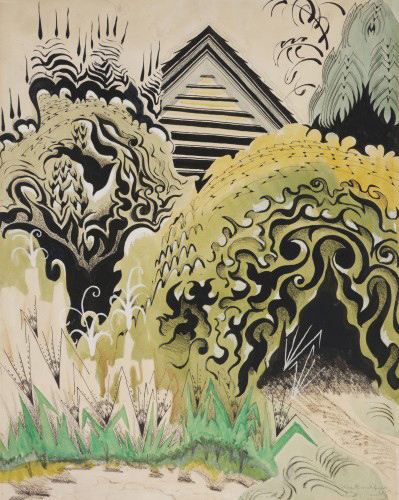 This is a great article – I am so interested in seeing more of Burchfield’s work! Your enthusiasm is contagious. I will watch the videos, and hopefully see the show, as it is up to Jan. 7th. I don’t have words for his work – reminds me a bit in its power and imagination in nature to the Canadian masters, the Group of Seven. These have been my favorite painters for years, now I can add Charles Burchfield. Thanks! 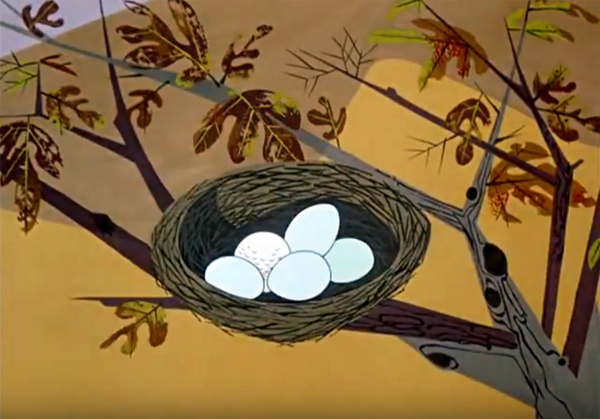 I’ve long thought Burchfield’s imagery has to have been an influence on some of Disney’s animators. 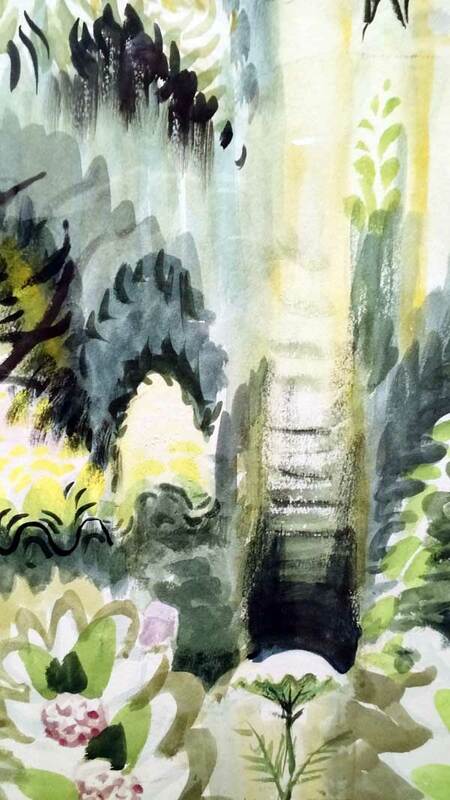 For example Disney’s “haunted forest” feeling seems to have just come right out of innumerable Burchfield paintings. It’s interesting to read how much Burchfield had to say about Disney’s animations. I hadn’t known this part of the story. My wife and I are planning on seeing the Montclair Museum Weather Event next month. Thanks again for your great blog post! Welcome to my blog and thank you for taking an interest in my work. My original website has been archived and can still be accessed at www.johncanemaker.com.